Last week Joss featured British Airways' ‘Look Up’ digital outdoor campaign on his blog for the Marketing Society that got people all over the world talking. This week we’ve stumbled across this lovely parody from pizza chain Dominos. 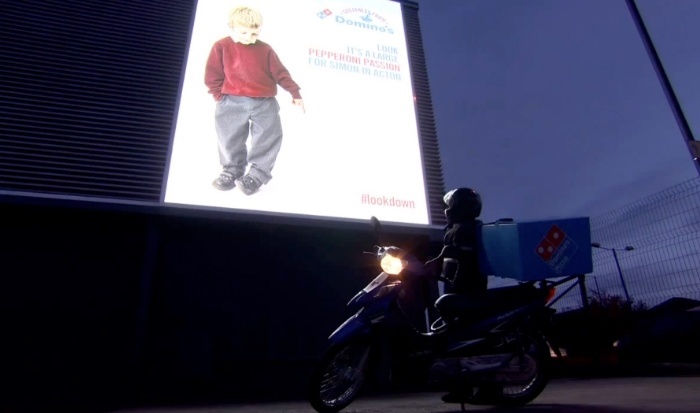 The brand placed a digital ad on a billboard which featured a child pointing down with the hashtag #lookdown and ‘Look, it’s a large Pepperoni Passion for Simon in action’ clearly visible. Beneath the sign was a pizza delivery motorcycle with Simon’s order ready to go. Nice quick reactions from Team Domino’s that put a smile on many a face this week.